Well-wishes are instore for my brother and his long-time girlfriend who will be tying the knot end of the year. It has been a dating marathon of many years for them and all of us are happy that they have finally made up their minds to get hitched. 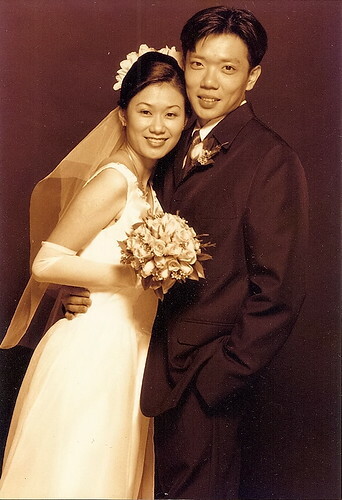 Their good news brings back memories of my own wedding nine years ago. The hectic preparations prior to the event brings a smile to my face as I recount the countless decisions that needed to be made. We were blessed manifold by our wonderful family and friends in so many ways and we truly had a fantastic wedding, just the way we wanted it done. Come next year, Hubby and I will be celebrating our tenth wedding anniversary. I am fully convinced that I married my soulmate, a man whom I will still choose if I have to choose a life partner again. In many ways, he is the opposite of me and in that same number of ways, he is my balance. He brings a calming balance to my vivacious side, an analytical mind to my passionate nature. He takes on the role of a creator of beautiful things to my appreciation of beauty, an ocean of thoughtful ideas to my outbursts of emotions. Dear, I love you. I am pondering over how we will commemorate the special year. Nothing too fanciful but definitely something meaningful. Perhaps a studio photo session with our kids? A pair of couple watches? Or a nice dinner celebration with the extended family? Maybe a second honeymoon for just the two of us? This picture in today's edition of The Straits Times brought tears to my eyes. 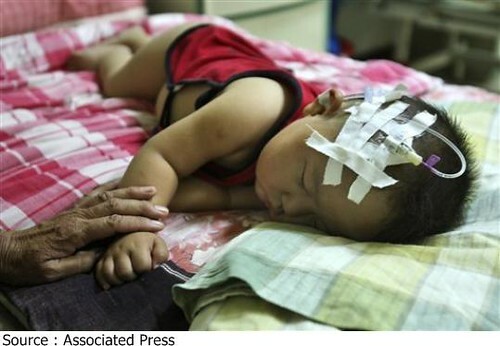 It so poignantly speaks of the plight of thousands of Chinese infants in the latest China tainted milk scandal. I read with horror at how thousands of infants developed kidney stones and other related health problems after consuming formula laced with melamine. My mind recoiled at the atrocities committed against such helpless and dependent victims, unable to fathom the impetus for putting innocent young lives at stake for selfish gains. As a testament to how inter-linked the world now is and how processed many foods have become, the chain of affected food products has extended to products manufactured outside of China. I did a quick check of my fridge and ditched several 'Made in China' products into the rubbish bin. However, I remain wary as it was reported that Singapore food manufacturers use non-branded milk powder and dairy products from China. As tests continue, who knows what else will be found to be tainted too. As a precaution, my family will be staying away from as much dairy products as possible, probably limiting ourselves to those produced in countries with their own cows. Big Buddy came home with this small card tucked into his bag. Subsequently, his nursery teacher confirmed that he has been selected to be the emcee for his class item for the school concert. So, the purpose of the card is for us to help him memorise the scipt. I admit I am secretly pleased and proud that Big Buddy is given the opportunity. At the same time, I wonder how he will react in front of so many people as he tends to be rather shy in the presence of crowds. This brought to mind the time I was asked to audition for an emcee role in my junior college's production by the Chinese Literacy Drama and Debating Club. On the encouragement of my Chinese class teacher, I joined the club to improve my Mandarin. I remember standing tongue-tied on stage while being prodded and exhorted to say something to introduce the production. No prizes for guessing how that audition turned out for me. I strongly hope Big Buddy will fare way better than his mother did then. The past 48 hours have been face-changing for the financial sector. Ripple effects of the US sub-prime crisis had never hit home so close as the news about AIG, the insurer for several of our insurance policies. I read with growing unease about how Merrill Lynch and Lehman Brothers have been drawn into the Wall Street carnage with buy-outs by Bank of America for the former and Barclays for the latter's US units. Events moved so quickly that it left little time for reaction, leaving many in the tailspin of the whirlwind. In a knee-jerk reaction to the AIG gloom, many responded quickly. Not that I blame them, I guess it is the survival instinct that kicked in the need to do something and not just sit and wait for the worst. Hubby and I spent a good part of last night assessing the opportunities and risks in the current market turmoil with our financial advisor, who called to address any concerns we might have in view of the recent events. Hopefully things will pan out well in the days to come. It is early days still. 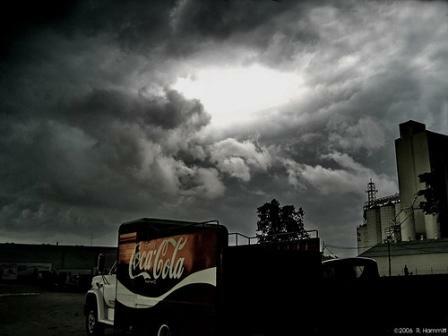 Yet I sense the peace of God even in the midst of all this, akin to being in the eye of the storm. We happened to walk by the Crossroads, a Yellow Ribbon Project exhibition at Marina Square yesterday. 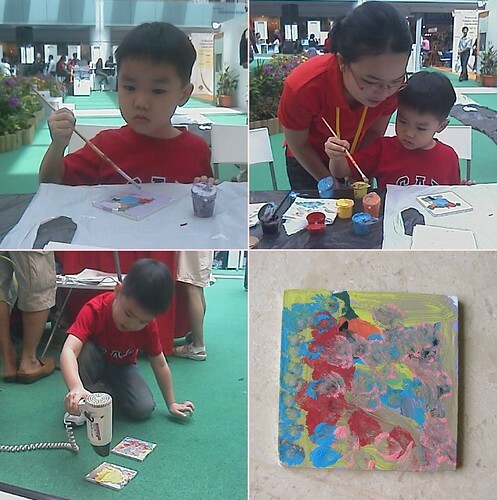 There was a booth organised by hansart, one of their sponsors and my boys were invited to try out tile painting. 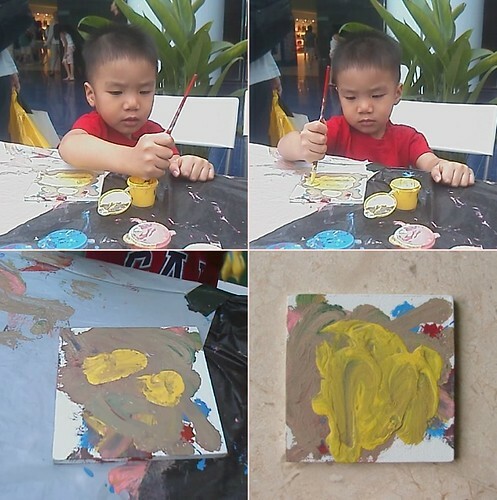 Because of the age difference, both boys were given different art materials. Big Buddy was instructed to draw a design in pencil on his blank white tile before going over with paint while Little Buddy was given coloured markers and told to draw straight away on his. That went rather well till Little Buddy saw his brother working with paint and his independent streak took over. Little Buddy demanded to be allowed to use paints with full autonomy as to how he should hold the paintbrush, what colours to use and where to apply the paint. Considering his age, he has rather good control of his fine motor skills, managing to produce a fine piece of work all on his own. Big Buddy displayed an acute interpretation of his version of a dog and a cat which he painstakingly drew with a pencil but which resulted in an interesting smorgasbord of colours. The session concluded with 2 proud parents and 2 happily-satisfied boys, a proud Big Buddy and a paint-streaked Little Buddy. That got your attention, did it not? I got that from a book I am reading. It is one of those tricks that school kids make up to help them remember information that never seem to stick in memory. My very envious mom just stole Uncle Ned's underpants = Mercury, Venus, Earth, Mars, Jupiter, Saturn, Uranus, Neptune, Pluto. Cool eh? How do you remember your 9 Times Table? Hold up both your hands. Bend the last little finger on your left hand, showing nine remaining hands and that is 1 x 9 = 9. Bring the little finger up and bend the ring finger next to it, showing 1 finger on the left of the bent ring finger and 8 fingers to its right. The answer to 2 x 9 = 18. You get the whole 9 Times Table just by bending one finger at a time, moving from the left to the right. ROYGBIV = red, orange, yellow, green, blue, indigo, violet. Colours of the rainbow in sequence from the outer to the inner curve. Come to think of it. Since finishing school, I have yet to encounter a situation that called upon the need to have those information remembered in sequence. But it is kind of fun, making up nonsensical acronyms, stories and what-nots just to make information stick. This morning Big Buddy gave us a nice present.....a dry pull-up pants! Finally, after a long long time, Big Buddy woke up this morning with a completely dry pull-up. The very first time despite him not having woken up in the night to use the toilet. After waking up this morning, he went to the toilet and came to tell me 'I'm dry!'. Heh heh.....maybe this is the result of telling him how wonderful Little Buddy has been at not passing urine into his diapers for the past one week. Just as I was resigning myself to the thought that it may take him quite some time before he manages to wake up to use the toilet at night, he springs this nice surprise on us. This just proves to me yet again never to underestimate the influence of one sibling on the other and to remain optimistic in the face of challenges of bringing up children. A breakthrough will come at the moment you least expect it to. 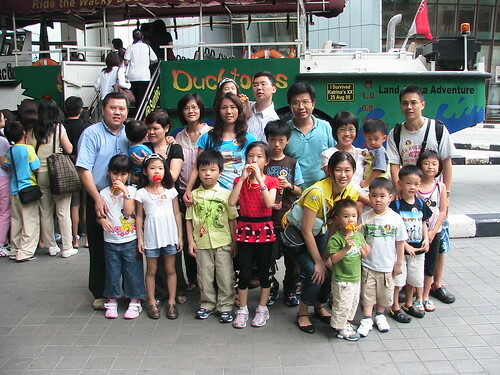 Our family joined some friends on the Duck Tour yesterday afternoon. We were warned that weekends are busy times and it will be advisable to pre-book the tickets especially if we had a large group. And a large group we were too - 11 adults and 12 children. Considering the fickle weather recently, thankfully the weather held up and we had a dry and sun-hiding-behind-clouds kind of day. 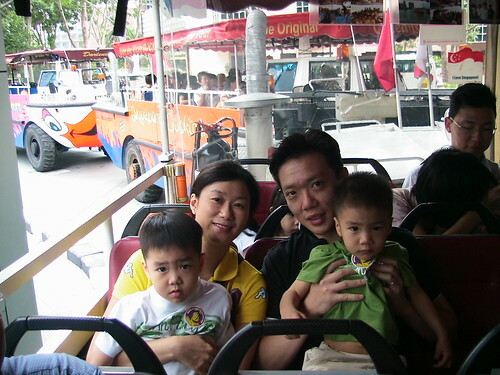 Honestly, Hubby and I were not too impressed with the Duck Tour. 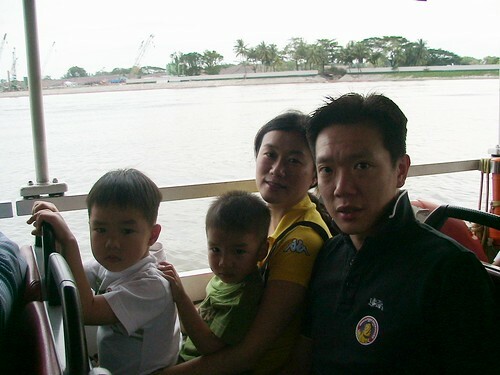 The ride was not very comfortable and it got quite bumpy when on the road. The scenery was quite boring since the buildings have been there since eons ago and the Marina area is undergoing major construction. It was like one huge construction worksite. The only interesting bit was the informative trivia that the tour guide dished out along the way. But the reaction of the kids was different. Big Buddy was excitedly anticipating the Duck Tour as he has this fascination with the various modes of transportation. He could not wait to get on the vehicle and Little Buddy was just game to do whatever his brother was doing. They particularly enjoyed the water part of the ride, waving and shouting hellos to the other boats that passed by. The joy of the kids was enough to make it a satisfying trip for us. To see such bliss and enjoyment on their faces made our day. Yes, that is the whole bunch of us. Oh by the way, if you are contemplating a ride, be informed that Singaporeans and PRs are eligible for 30% discount off ticket prices although this is not advertised on their website. 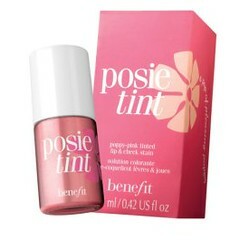 1) posietint - touted as the cheekiest flush you can get from a bottle. It was a toss-up between this and the benetint and I finally decided to get this instead as it has been recommended for those with fairer complexion. 2) that gal - a brightening face primer. I have been looking around for a primer and this seems easy enough to apply. 3) dr. feelgood - an invisible balm for matte skin. There had been some feedback that it can clog up pores but I decided to take a gamble as I shine like a Christmas lightbulb after 3 hours. I wanted to see if this will be effective for me. I tried out dr. feelgood today and it did somewhat help keep the shine at bay. My makeup lasted almost 6 hours before any hint of an oily shine showed through. A couple of weeks ago, I was racking my brains on what to get for Big Buddy and Little Buddy's teachers at school, enrichment class and church. I had aimed to get something nice with a personal touch as gifts for them. 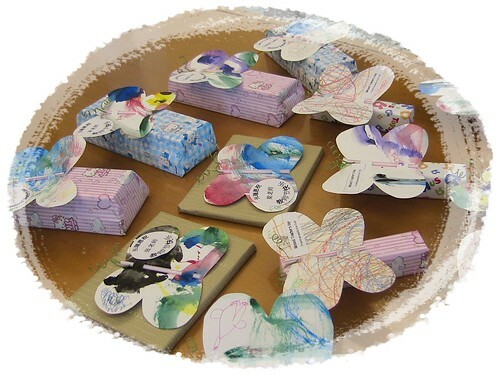 Finally, we settled on chocolates and Marks and Spencer biscuits and handmade the butterfly gift cards using some of Big Buddy's past artwork. The message tags were created using WordArt. Over the course of a few hours, both boys chipped in and created these. 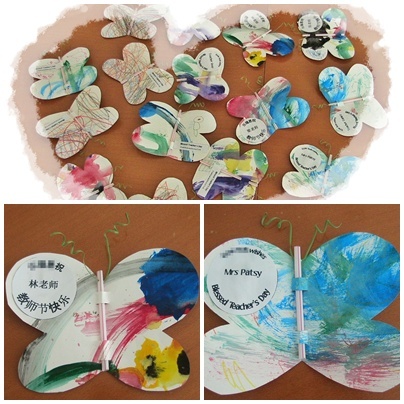 During the past few days, both had fun handing them out to their various teachers.